Big power plants generating megawatts of electricity are essential for keeping large-scale infrastructure running, but households and small communities can provide some or even all of their own power without using fossil fuels. Some is in the form of electricity, and some in the form of heat energy. A lot of the technology used to produce this local power is still being perfected— it is not as efficient as it might be, and it can cost a lot. But its efficiency will improve, and as more people start using devices such as solar panels and heat pumps, they will get a lot less expensive. Soon they will be as common as satellite TV. 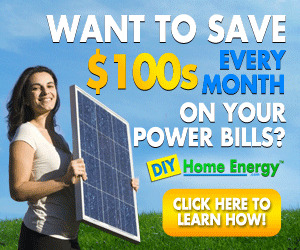 Some solar panels generate electricity. These are built up from many solar photovoltaic (solar PV) elements that convert light into electrical energy. They work best in sunny places like the southern United States, where they can run the air-conditioning systems that use most power when the sun is shining strongly. In the developing world, solar panels linked to batteries provide lighting for households that would otherwise rely on oil lamps. 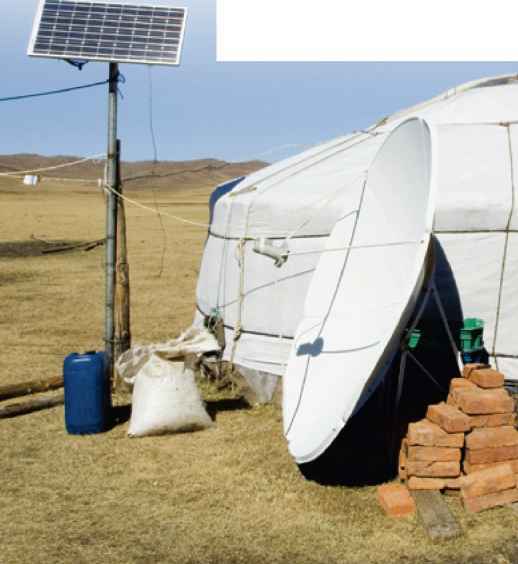 Here the clear skies over Central Asia allow a small solar array to power the TV of a Mongolian family—linked to a huge satellite dish that almost dwarfs their traditional home. 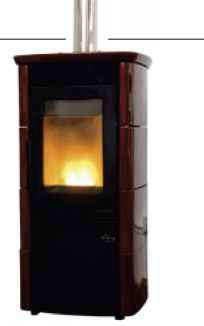 WOOD-BURNING STOVES Burning wood or similar plant products in a solid-fuel stove to provide heat can be carbon-neutral, if the carbon dioxide that it releases is absorbed by the growth of new fuel plants. Fuel can also be made from waste wood, and from other waste products such as cardboard and paper that might otherwise be buried in landfill sites. But such "biomass"fuels are only suitable for small-scale use, because growing enough of them to fuel a city would use up far too much land. 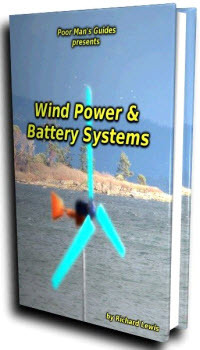 For decades sailors have used wind generators to recharge the batteries on their boats. 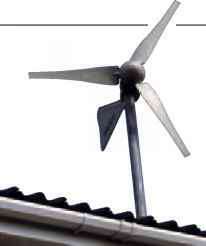 Similar technology can produce electrical power for houses, although a small wind turbine like this would generate only a small fraction of the electricity used by a typical household. 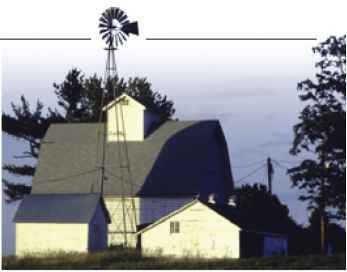 Larger turbines provide more power, but many houses are not built strongly enough to support them. More efficient turbines will eventually become available, however—and if people find ways of using less energy, local or domestic wind power will become a more viable option. 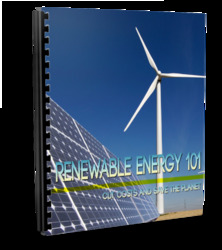 One advantage of small-scale power generation systems is that they can be easy to set up and maintain. Wind pumps such as the one shown here have been used to pump water for centuries, because they are simple and reliable, and can be repaired without specialist knowledge and equipment. Small power generators are more complex, but many can still be maintained by the people who use them. 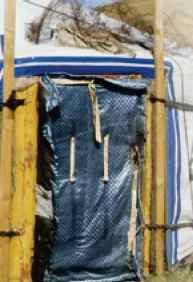 This makes them ideal for use in developing countries, and by people who live in remote regions. They also allow people to live comfortably without relying on national grid networks, which can be valuable if conventional power supplies fail. People who have access to streams—especially fast-flowing upland streams—can sometimes harness their power to provide free, reliable electricity without generating any greenhouse gases. 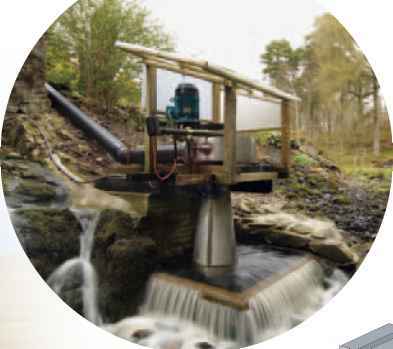 These small hydroelectric systems typically use small turbines rather than large wheels of the type once used by watermills. But they do rely on a good "head of water"to build up enough water pressure and keep the turbine running during dry weather, and this often involves creating the modern equivalent of a millpond. Very few people have enough space, even if they have the water. In winter, the temperature below ground stays higher than that of the air above. The heat can be collected using a long coil of pipe containing water and antifreeze, buried in a garden or beneath a house. 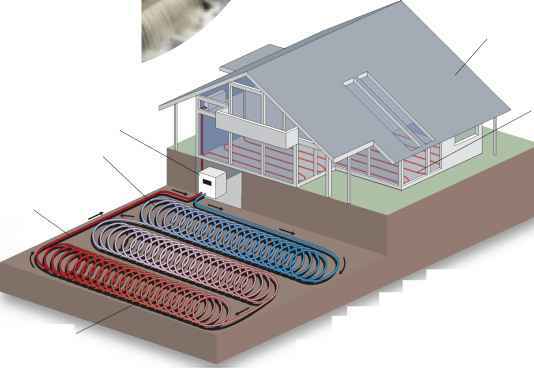 The warmed fluid passes through a heat-exchanger linked to an underfloor heating system, and although it needs an electric pump, the technique generates up to four times the energy it uses. There are already about 600,000 ground-source heat pumps working in the United States.